Star Bite: Salad days? It's a whole month! Know how every month seems to be designated National Something Month? The people who produce salad goods have claimed May. We're always trying to get a head start on things here at The Star, as noted by our salad story a week ago -- Lettuce rejoice -- and Friday will be our weekly food gathering, with the spotlight on salad. Right now, there's a slew of salad greens seedlings in our back yard ... just waiting for the rabbits who seem to think the Bibb, buttercrunch and Boston lettuce are planted just for them. When we say salad, so many people get locked into iceberg lettuce drowned in dressing. Not only does that fail to do justice to the wide variety of salad greens out there (another cooking jihad: the end of iceberg lettuce as a main ingredient), it too narrowly defines what a "salad" is. We'll have pasta salad, some chicken salad, a range of vegetable and fruit mixes. Salads can be a healthy way to eat fresh, seasonal ingredients. When crammed with high-fat toppings and buried in dressing, they can also be some of the worst meals out there. Hear us, fast-food folks. One element becoming popular with salad connoisseurs is soy -- a staple in Asian diets for centuries. Soy is jam-packed with protein—the only plant food that has the same equivalent as an animal product. Studies have shown soy protein will decrease your appetite, keeping you full longer and less likely to snackbetween meals or gorge at dinner time. I don't recommend tossing a hunk o' tofu on the salad bowl, but edamame (right) adds a simple crunch and some lovely color. According to Dr. Mark Messina, adjunct associate professor of nutrition at Loma Linda University, some studies have even shown soy to decrease body fat. Soy also has been shown to lowers "bad" cholesterol about 4 percent, which is supposed to risk of coronary heart disease by about 10 percent. Obesity has been linked to diabetes in many individuals. 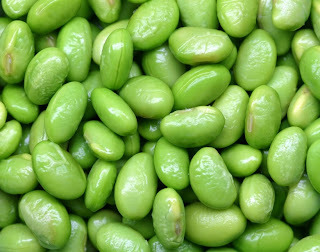 Along with protein, soy contains isoflavones which may reduce blood glucose and insulin levels while stopping fat tissue build-up and enhancing the breakdown of fat. While lowering your blood glucose levels, soy can reduce your blood pressure as well. The American Heart Association estimates high blood pressure affects approximately 50 million Americans and one billion people worldwide. 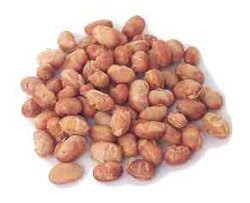 Substituting soynuts (right) for other protein sources in a healthy diet appears to lower the blood pressure in postmenopausal women, and may also reduce cholesterol levels in women with high blood pressure, according to a report. That said, don't blow a healthy salad on a ton of dressing. Here are some soy versions, courtesy of the Soy Foods Council, naturally. They're a little different than traditional dressings, but quite tasty. Mix the ingredients together, and you have a low-fat, protein-filled ranch dressing. In a ¼ cup there are only 48 calories, as opposed to regular Ranch dressing which contains 140 calories in 2 tablespoons, or 280 calories for ¼ cup. 2 tablespoons chopped green onion. After combining the tofu, water, vinegar, lemon juice and chili sauce in a blender, stir in the pickles, green peppers and onions. For ¼ cup, there are 50 calories, 3 grams of soy protein and 7 grams of carbohydrates as opposed to regular Thousand Island that has 59 calories per tablespoon or 236 calories in a ¼ cup. Combine all ingredients. There are 17 calories per serving, 1.4 grams protein, 1.6 total carbohydrates and .4 grams of fiber. Combine the first eight ingredients in a large bowl. Make dressing with lime juice, garlic, cumin, salt and soybean oil; combine well. Pour over salad ingredients and toss lightly to combine. Chill several hours before serving. This recipe makes about 8 cups with 117 calories per serving, 8 grams protein (6 grams soy protein), 16 grams carbohydrates, 3 grams fat, 0 mg cholesterol, 340 mg sodium, 40 mg calcium and 5 g dietary fiber.